Vodafone has launched a broadband minimum speed guarantee which promises to cut your monthly bill if your speed drops – but only if you tell it. From today, Vodafone is offering a minimum speed guarantee to new customers taking its revamped fibre broadband, or those who are out of their existing contract and want to upgrade. Those opting for the Superfast 1 38Mb service at £21/mth are guaranteed minimum download speeds of 25Mbps, while the Superfast 2 76Mb at £26/mth commits to 55Mbps. Before you sign up, Vodafone will provide speed estimates for your line – which may be above or below the guaranteed levels. If it fails to deliver the speeds it promises to your router at ANY point, it will apply a 15% discount to your next bill – but only if you check and claim it. If you are receiving lower speeds than those estimated when you signed up, you may be able to leave penalty-free, see our Cheap Broadband guide for more information. You have to download the Vodafone Broadband app (available on iOS & Android) to access its speed checker. You can check your speed via the ‘info’ menu and if it shows a lower speed than the guarantee, you can instantly apply for the discount – directly via a button in the app. Your next bill will be automatically credited with a 15% discount, and will remain in place until the issue is fixed. Vodafone will notify you that the discount is in place and may contact you in order to fix the issue. If it corrects the problem, it will email you to confirm your speed has been restored and when the discount has been removed. This is the important one. Vodafone guarantees the ‘sync’ speed, which is essentially the speed of your broadband when it reaches your home router. It does not cover the ‘throughput’ speed – the speed you will actually receive on your devices – and the one usually recorded by speed checkers. This is why you must use the Vodafone app to check your speed, as this is linked to your router. Vodafone says this is because there are many factors that could impact the actual speed – such as the position of your router or interference – and the speed guarantee is intended to address any issues Vodafone is in control of. This ultimately means you may get lower speeds in practice than the guaranteed ones – and won’t be eligible for the discount. 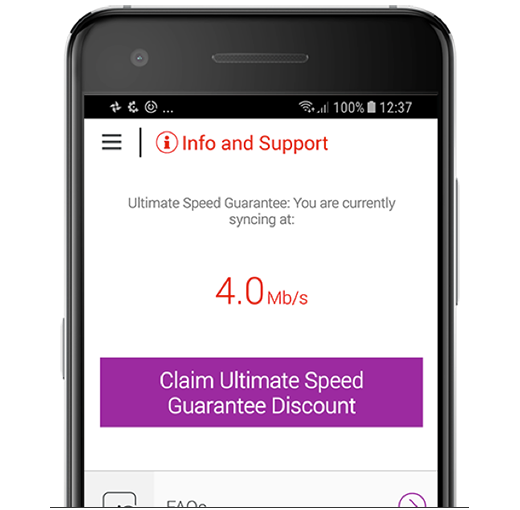 Although you still may experience slower speeds in reality than the guarantee, Vodafone does at least have an incentive to provide consistently reliable speeds. Aside from the guarantee, Vodafone has very simple pricing and at the end of the contract the prices stay low, so you won’t be met with huge out of contract hikes if you forget to switch. It’s cheapest to sign up via a comparison site such as our Broadband Unbundled tool – or via the links in our guide – as everyone will qualify for the Superfast 1 package at £21/mth or Superfast 2 for £23/mth. Go direct and you’ll be charged £2/mth more if you’re not a pay-monthly Vodafone mobile customer, or stop being one at any point during the 18 month contract. Comparatively, the current best deal comes from Virgin with 50Mb fibre at £18.17/mth over 12 months, so Vodafone can be beaten on price. See our Cheap Broadband guide for more information. Vodafone chief executive Nick Jeffery said: “Customers want guaranteed broadband speeds they can rely on. Thats why we are launching the ultimate speed guarantee.